Because the history of watermills dates back thousands of years, we sometimes forget they were the forerunners of the manufacturing process. Drewetts Mill, reputed to be one of the mills in the Domesday record, was still in working order in 1990. Box Brook (also known as the By Brook) is the only water course in the neighbourhood capable of supplying any power worth mentioning. 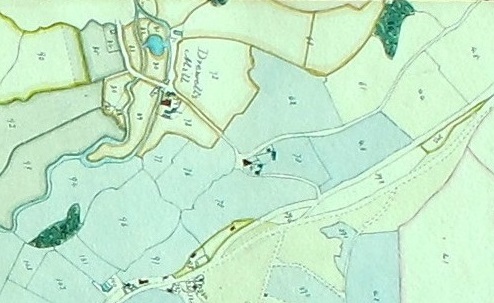 We find, moreover, that at an early date the mill on Box Brook which is now known as Drewetts Mill was in the possession of the Lords of Hazelbury. The Mill itself is doubtless one of the two mills mentioned in the Domesday survey, and its identification today is easy. It is still a mill on Box Brook, and is known now as Drewetts Mill, but in a terrier (survey) of the property of the vicarage of Box dated 10th December 1677, it is referred to as Parker's alias Croc mill, the name of its owners in the twelfth century. A curious point with regard to it is that it seems to have given a name to the family which worked it, for in 1422 at a view of Frankpledge (peace-keeping committee) for Hazelbury held at Ogbourne, one John Crokesmill was fined three pence for taking excessive toll. We have managed to find the owners of the mill back to Domesday but no further. Drewetts Mill first came under the Hazelbury estate. The Croke family owned the estate from 1086-1482. This was over fourteen generations. They were sometimes referred to with their names spelt in various ways: croc, crouk, crook, crouc and crokes. The mill was also referred to as croc mill alias parkers.We have been unable to find out why the mill was called Parkers; it could have been because of a miller called Parker. Anne Croke was next in line for the estate in 1482 but she married John Bonham so the estate was passed into the Bonham family. The Bonham family owned Hazelbury estate for almost one hundred years, which was four generations. Each generation was called John Bonham and they all, except the last, married a person called Anne. John Bonham III in his will left the estate to a Sir John Clifton. This was because John Bonham IV was not yet 21; he would have the estate then, when he came to 21. He wanted the estate but John Clifton would not let him have it; he only mortgaged it to him. Soon after John Young bought the estate which consisted of a manor, 6 messuages, 10 cottages, 3 dovecots, 16 gardens, 10 orchards, 800 acres of land, 100 acres of meadows, 200 acres of pasture, 400 acres of wood and 20 shillings rent in Box, Hazelbury and Wadswick. Soon after (in 1602) John Young's son, Robert, sold the estate to William Wolascote, Henry Sambourne and Anthony Elms for £400. They were acting on behalf of Hugh Speke. We mustn't think that the mill was always used for corn- grinding. In feudal times and later it was a major source of power for heavy lifting and sawing. During the 1400 and 1500s, many mills on the By Brook were converted into fulling mills to clean and thicken wool for the burgeoning cloth-making trade in Wiltshire. Set on a slope which afforded a fast flowing stream, it is possible that Drewetts was converted; then later restored to grain processing about the time of the Civil War. The Spekes owned the estate for one hundred and twenty-five years as in 1726 AS Petty (a branch of the Speke family) sold the estate to Lord Northey. Lord Northey owned Hazelbury until 1919, but the mill did not stay with the estate as in the 1770s Lord Northey sold the mill to Edward Lee who was the miller at this time. Edward Lee owned the mill until the 1830s. Edward Lee did not work the mill; he leased it to tenants. One tenant, William Gibb, paid Edward Lee £2.19s.10½d to rent the mill. In 1825-1830 the miller was Thomas Browning. He also worked a farm which was called Drewetts Farm. On a map dated 1626 the mill is called Browning's Mill; this was probably because of a miller called Browning, not Thomas Browning. Edward Lee sold the mill in the 1830s to the owners of the Hartham Estate, the Goddard family. As far as we can find out, the Hartham Estate and the mill changed hands several times during the middle of the nineteenth century: first to a man called JA Case. He sold the estate to a TP Fielding and he in turn sold the estate to a TA Poynder who sold Drewetts Mill to the Tucker family in 1910. Mr W Tucker not only owned the mill but he became the miller. He milled and rolled the corn for local farmers and had his own horses and carts for deliveries. The ownership of the mill passed to his son Mr Leslie Tucker who was an active miller still at the age of 80. At one stage the mill was operated by an overshot stream which powered three separate grinding stones. 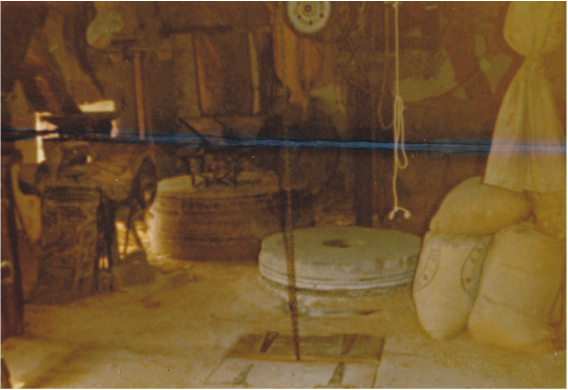 In the picture above there are two milling stones and a saw, all of which were powered by turbines. It is a little hamlet all of its own with a mill house and cottages to house the family and support staff needed to move heavy weighted items. In the Land Tax assessments for Box in 1801 we found that William Gibb paid Edward Lee £2.19s.10½d for renting the mill.